When I met Steve Vold at the MCBA Fall ComiCon, he thrust a copy of Zombie B.C. into my hands and told me, “I hope you don’t mind gore or violence.” Little did Steve know that one of my all-time favorite video games is Gears of War, which involves chainsawing Locust creatures in half. Leafing through the first couple pages of his comic, the gore was quite apparent in each of the panels. But even without his warning, I could have expected that, since Zombie B.C. details the beginning of a horrific zombie outbreak—gore is just a part of that kind of story. I was able to briefly talk with Steve about his work, including his hopes to someday bring Zombie B.C. to the small screen and how his dog inspired an issue in the series. Mariah Kaercher (TCG): Can you give our readers a brief introduction to the world of Zombie B.C.? Steve Vold: Zombie B.C. is a four-part comic-book series of various viewpoints that are all connected by a single zombie outbreak. 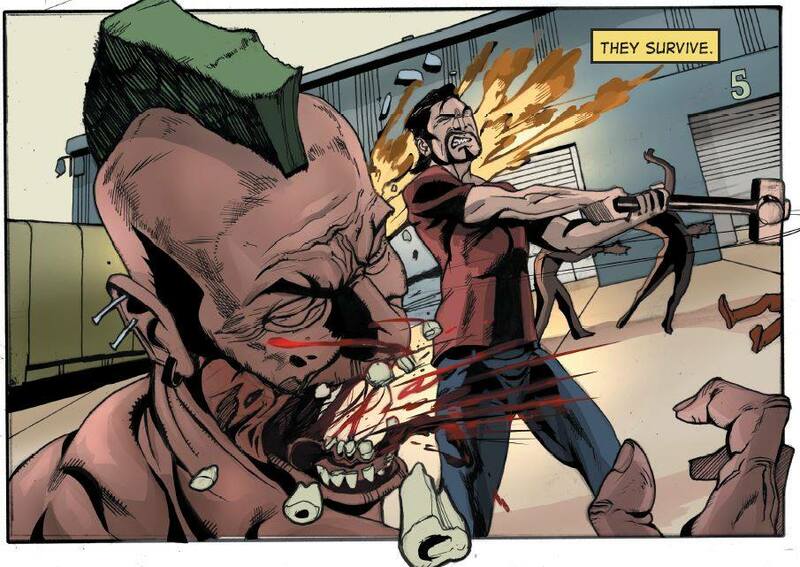 Issue 1 follows the first recorded zombie outbreak in the history of man. Issue 2, “Dog of the Dead,” takes place in present time, where the outbreak is shown through the eyes of a police dog. Issue 3, “The Good, the Bad, and the Hungry,” picks up with the young girl from issue 2, Rae, all grown up and surviving in a zombie postapocalypse. Issue 4 will take place in a different galaxy, where readers witness an alien abduction gone wrong. This final issue will wrap up the Zombie B.C. series with an unexpected twist. TCG: This series is one of your first experiences diving into comics. What was the process to getting your comics published? Steve: I’m almost 40 years old now, but I’ve wanted to make a comic book since I was in high school. I went to school for graphic design, and I think it was well established by that point this was something I needed to do. I was set on making a zombie comic, but didn’t have a good concept yet. Once the prehistoric era and name were established, the wheels were in motion. My original plan was to be the illustrator and have a friend do the writing, but I found out how much time goes into one page, let alone one panel. Overall, I just wasn’t happy with my artwork. After a few pages, I realized I needed help. Now, fast forward 10 years and several different artists—I found lead artist Steven Williams on DeviantArt, and we’ve been working together ever since. After issue 1 was created, I tried reaching out to multiple publishing companies but never received any interest back. I, like most other independent comic creators, have been self-publishing from the beginning. The master plan is to complete the four-part series, then attempt to pitch it to Hollywood. I will not rest until Zombie B.C. is on the big screen or Netflix. TCG: It would definitely make for a thrilling TV show. What is your experience when it comes to TV or screenwriting? Steve: I appreciate the compliment! I’ve always wanted to sit in the director’s chair, but I would certainly be open to screenwriting. I’m not sure I would be too valuable since I’ve never even read a screenplay. However, a good portion of my life has been consumed with television and movies. I grew up close to a shady video store in Litchfield, Minnesota, and they would let me rent anything. Basically, that created this monster talking to you today. I do have some standards that I won’t budge on. I couldn’t let this be on [a network] that holds back on violence or gore. The Walking Dead does a really good job at getting away with it on AMC, but I would prefer to go all-out with a premium cable channel like Starz or HBO. TCG: I loved issue #2 being told from the police dog’s perspective. What motivated you to write an issue with an animal having a big part in the zombie apocalypse? Steve: Issue 2 came straight from the heart. It had to take place in the present time, and I was insistent on doing something completely different; I was close to going with an elderly woman defending herself and her catatonic 60-year-old child during a zombie outbreak. I was constantly hitting a roadblock, and when I looked around, my shepherd mix was always looking back at me. He was just begging to be a star! Eventually, the lights came on, and it sunk in that [a comic about] a zombie outbreak through the eyes of a dog hadn’t been done yet. I love all animals, and I especially love dogs, which goes with the old saying, “Write what you know.” From that point on, “Dog of the Dead” basically wrote itself. I enjoy bringing my dog to a fundraising event for Midwest Animal Rescue and Services once a year and selling “Dog of the Dead” to the crazy animal lovers. It’s hilarious to see how much attention he gets from his fan base. TCG: You mention renting horror movies at a young age, but what about comics? Did you have access to many horror comics? Steve: Unfortunately, Pamida was one of the only places that sold issues in Litchfield when I was growing up. I could get my hands on the standard Marvel and DC issues, and I loved them, but no horror was available. It wasn’t until I got my license and ventured to the big city of St. Cloud that I found the comic Preacher. I felt like that series was a gift from God. It was just something about how vulgar it was compared to what I was used to reading. A few years later, I found myself living in the Twin Cities, and that is when The Walking Dead caught my eyes. I couldn’t believe someone made a zombie comic, let alone a good one! At that point, I knew a zombie comic could happen, and that truly set the wheels in motion for things to come. TCG: In a zombie apocalypse, what would be your weapon of choice? Steve: Countless thought has been put into this question over the years—it would be a 24-inch wrecking bar. It’s like a crowbar, but slightly larger. This thing would crush a skull like a melon, and it’s never going to break on you or run out of ammo. On top of that, it’s a functioning tool that can pry things open you normally wouldn’t be able to open. It weighs about two pounds, which is the main drawback. Bear in mind this zombie outbreak doesn’t contain zombies that can run; if that scenario exists, I’m not even going to try to survive in that world. I would to take my own life day one versus being eaten alive over several minutes. TCG: Besides your zombie obsession, which other monster would you want to develop a comic series about? Steve: I’m a huge horror fan, and I’ve never seen a comic that scared me. There are plenty of extremely gory comics, but nothing too terrifying; It’s weird because there are countless horrifying illustrations in this world. I would love to take a stab at a ghost story. I do believe a short series on a haunted house could be attractive. I have something in my head about a ghost traumatizing some 40-year-old guy who still lives with his parents. I don’t believe in ghosts, but I definitely believe in the fear they can cause from personal experience. I think it would be a blast trying to inspire fear through a comic. 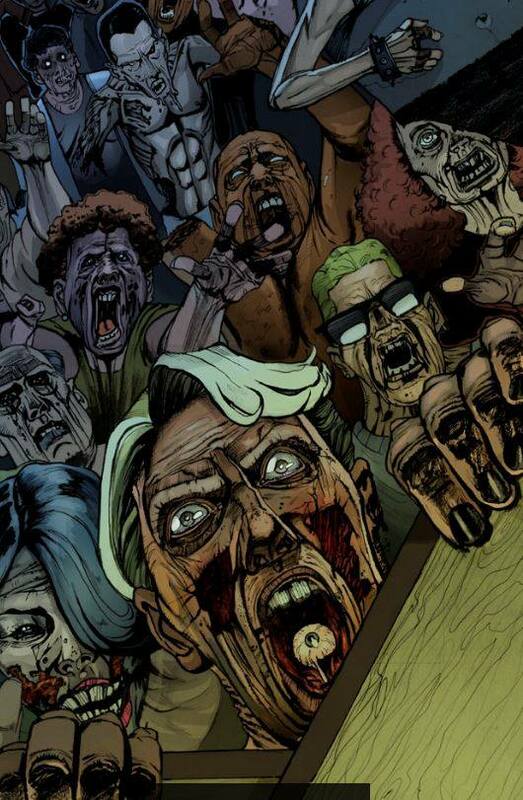 You can find the first three issues of Zombie B.C. in local comic shops, order them through the series’ official website, or download them in digital format on ComiXology. Issue #4 is forthcoming. Minnesota comic fans can catch Steve Vold at Crypticon Minneapolis in November 2017, and chances are good he will also have a table at the next MCBA ComiCon event. In addition to the Zombie B.C. website, you can follow the series on Facebook for updates.